யாழ். பண்டத்தரிப்பு செட்டிகுறிச்சியைப் பிறப்பிடமாகவும், லண்டன் Wembley ஐ வசிப்பிடமாகவும் கொண்ட குமாரராணி சிவஞானசூரியர் அவர்கள் 03-02-2019 ஞாயிற்றுக்கிழமை அன்று இறைவனடி சேர்ந்தார். அத்துடன் அனைத்து மருமக்களும், அன்புள்ள அன்ரியும், அனைத்து பேரப்பிள்ளைகளின் பாசமிகு பாட்டியும் ஆவார். 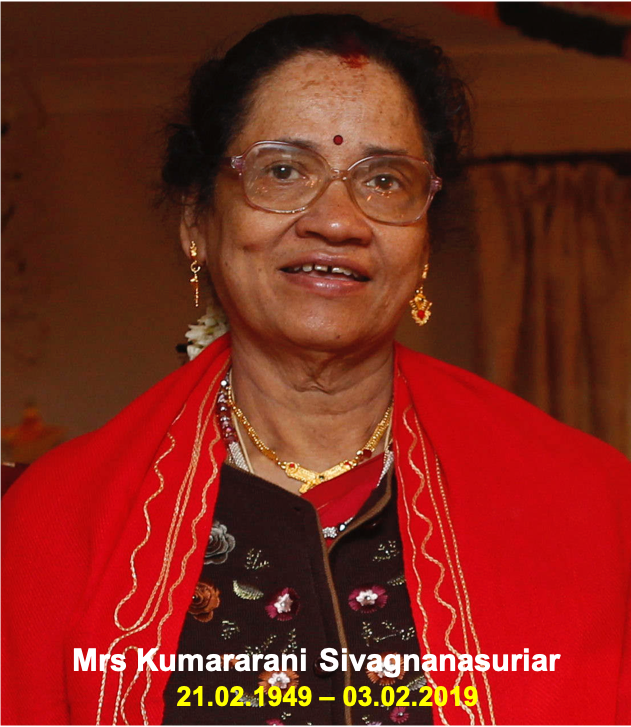 Kumararani Sivagnanasuriar was born in Chettikurichi, Pandatharippu Jaffna and Lived in London Wembley passed away peacefully on 3rd February 2019. The Loving beloved Daughter of late Paranjothi, Sinnammah and beloved Daughter-in-law of late Sinnathurai Iyer, Gnanamah. 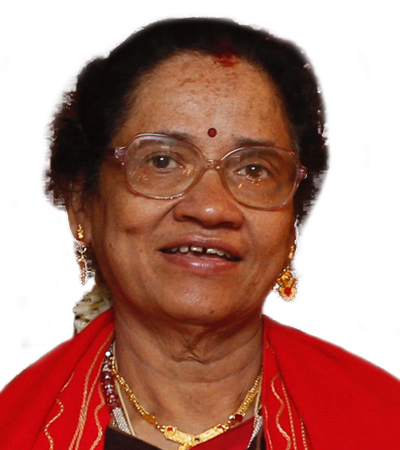 Loving Sister of late Balakumaran, Kumarambigai, Kumarasingam, Kumareswari. Loving In-law of late Vignarajah Iyer, Mahenthirarajah, Thevasena, Raveendran, Indrasena, Maheswarathas. Loving Periamma of Kohila, Kowchika. Loving Periaunty of Anpalahan, Kalaialahi, Kalaiarasi, Gnanavalahan, Kalaivani. Loving Mami of Nalini, Ranjan, Shalini, Eason, Uma, Theivamalar, Senthilkumaran, Meera, Sangeetha, Jayanthan, Janani, Lavan, Yuvan, Valan, Puliaachi. Loving Sithy of Premakumar, Uthayakumar, Mathivathana, Jeyavathana, Balakumar. Loving Periamma of Thusyanthi, Thaadsayini, Partheepan, Kupaeran, Prathas, Jeevathas, Bhairavi. And loving aunty of all the Daughters-in-law, Sons-in-law, and the love of all Grand Children. We are extremely sorry for your loss. Please accept our deepest and heartfelt condolences. Our heartfelt condolences to sooriar and all the other family members. We fondly remember her hospitality shown on our 1979 London visit. May her soul Rest In Peace! Treasured memories of a much loved caring and kind sister aunt and grandma never to be forgotten.